Hermit crabs are known for their adorable housing habits: as soon as they outgrow a shell, they have to find a new, larger one. 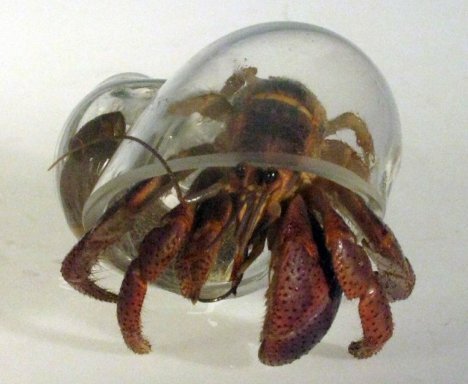 They usually go for shells from other hermit crabs, but they’ve also been known to inhabit “homes” like bottle caps and other human detritus. Artist Robert DuGrenier makes hermit crab homes that let us, the curious humans, see exactly what’s going on with those cute little decapods even when they’re hiding in their homes. 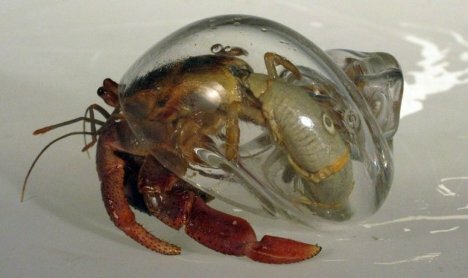 The blown glass shells allow for a rare view of the crabs’ soft bodies, which are normally hidden inside their mobile homes. DuGrenier sells the glass shells, which come in clear and colored varieties, starting at $14.50. See more in Earth & Nature or under Science. August, 2012.